But no one is afforded the prestige (some would say) nor the commercial success (others may cringe at this) like Piet Mondrian. And for this reason I will focus my attention to his work and the subsequent usage, translations, versions, and inspired pieces of his work. The question I’m attempting to ask here is whether or not these homages and reproductions are successfully saying something and, if they aren’t, why draw from Mondrian or art in the first place? I’m also making the claim that many of these reproductions are not in fact inspired by Mondrian at all. I don’t pretend to know everything there is to know about this art movement, as I’m hardly an art expert, scholar, but I may qualify as a curious dilettante. I am also under no illusions that I can thoroughly or accurately explain it in a mere blog post. So for my purposes, I will run through what is necessary to explain my case and leave the reading and pursual of knowledge to you, which is best anyway. To understand Mondrian, we must understand what his aims were. Thankfully, he had a rather compelling itch to write about his intentions and so we can draw straight from the source! 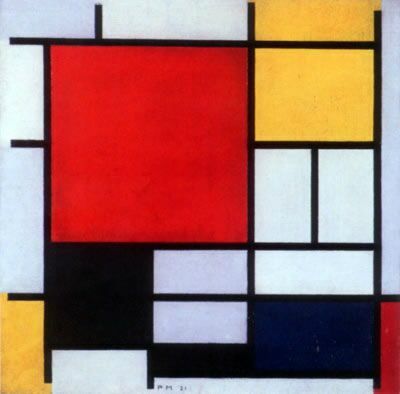 After the first World War Mondrian saw a need for a new form of expression given the world he existed in. This was a time for reinventing artistic expression, especially in the saddened, jaded remains of World War I. We could see such changes in other art movements, such as Dadaism or Surrealism. He thus developed “Neoplasticism”, a meaningless phrase that essentially referred to a “new art” and was disseminated through a Dutch magazine titled De Stijl, or “the style”. In that magazine, he wrote manifestos that expounded on his ideals for the world and for art. Inspiration from cubism. “The Gray Tree” 1912. Dipping into abstractism. “Pier and Ocean” 1915. “Tableau I: Lozenge with Four Lines and Gray” 1926. Its goal was, in simple terms, purity. The purest form of art, of painting, of life. While the Neoplastic was best represented in painting, according to Mondrian, the attitude of De Stijl and those artists was one of complete atmosphere. There was no trade off, one had to be entirely committed to the cause for the outcome of this artistic purity to have an effect. Thus we have architecture and furniture. This is a full-blown aesthetic, folks. Mondrian explains this relationship in his 1922 essay “The Realization of Neoplasticism in the Distant Future and in Architecture Today: Architecture, Conceived as Our Total [Non-Natural] Environment”—he couldn’t have written a more detailed title if he tried. As is typical with artists, Mondrian seems to hold a disdain for capitalism, consumerism, and the incessant need for the purpose or utility of a thing, even if that thing is art. He goes on to claim that in the dark and senseless times of the 20s, post WWI and at the start of mass industry, “art becomes an escape.” It is sought for comfort and for beauty, since such elements are lacking in reality. How then, can art be anything but a trivial commodity? A reach for beauty in an ugly world? Mondrian claims that a full embrasure of Neoplasticism, of pure art, would result in the cancelling out of this conflict. You wouldn’t need art, or meaning in expression. You would be whole. When that equilibrium, according to Mondrian is reached, there is no artist. There is only human being. There is no need for music that means something or dance that expresses. Artist and “non-artist” are the same. To Mondrian, his attempt to create the purest art form in painting was his attempt to equalize the ailments of modern man. It was his attempt to free art from constraint and to free us all with it. Now, however, we sell him. We haven’t the time to get into that. Perhaps another day. Notice that it directly references the straight perpendicular lines, the color blocking, and color choices of a Mondrian Neoplastic piece. At first, I took offense at this dress, of being “inspired” by a mere visual component, but YSL is smarter than that! I should never have doubted him. The dresses are of a jersey silk or just silk and weigh enough to prevent any sort of moment that would disrupt the boxy, canvas-like look of them. The print was not printed onto the fabric, but each panel of color and each line was individually dyed and produced. YSL created invisible seams that would make it appear as if the dress was one piece. In fact, it was many independent pieces. Obviously this was a labor-intensive process and thus required haute couture seamsters (the best in the biz)—these dresses were quite expensive. I feel as if YSL did Mondrian and his movement some justice, attempting a sort of wearable purity, an addition to the all encompassing De Stijl environment. Now they had architecture, furniture, art, and fashion. You could wrap yourself in simplicity. In terms of fashion and Dior’s 50s style of the New Look, it’s certainly legitimate to say YSL was asserting that simplicity was possible in haute couture, previously a space of decadence. 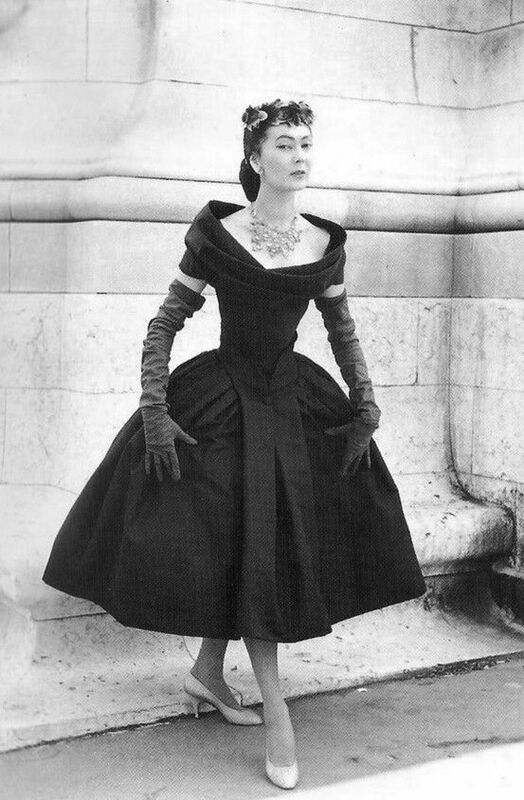 An example of Dior’s “New Look” style. Somewhere along the way, such regard for the ideas of Mondrian faded, either with time or with popularity—maybe a mixture of both. I found all of the above items with a simple etsy search. Many of them seem to be confused as to the era they’re harkening to, with the dress in the above left claiming both a Mondrian connection and the 80s. I’m not sure what the geometric undies are evoking but they’re supposedly Mondrian-esque as well. I feel as if Mondrian would not be so keen on hipsters wearing his paintings on their shirts—printed onto them no less! The point of his pure paintings flying swiftly past their heads as they strut to get fresh kombucha. Better yet, I found a post by Allison Hutchins on Brit + Co, a popular lifestyle website, titled “We Can’t Get Enough of These 14 Mondrian-Inspired Styles”—the irony of the use of the world style does not escape me. Described as a “must have for every 80s party you will ever go to in the future.” Because for no reason, I guess. Described as “colorful”, despite containing only primary colors and black/white/gray for a purpose. To be inspired by Mondrian, I wouldn’t think of the rather curvy form of human legs being a canvas for simplicity, nor would I think a simple travel clutch would suffice, as it contains the piece, reduces it to a print. And a Mondrian is never framed. What’s worse? Perhaps these earrings. I’m not certain why these would be “super” minimalist. Perhaps because they are small. Never mind primary color juxtaposed with black, white, and gray! Hell, as long as you look as if you’ve been to an art museum and can attach the name Mondrian to your ensemble, the social capital will be enough. To hell with the equilibrium of nature and humanity. Someone stop the man from jiggling in his grave. These are what Mondrian has inspired? A print, if that? It’s almost as if his reservations with modern art and the modern world have come true and that art truly is an escapist form of removal from reality. That, or it sells. And Bordieu’s social capital wins again. This is where I turn to Walter Benjamin, my personal god. His essay “The Work of Art in the Age of Its Technological Reproducibility” is my favorite scholarly work around. Its concepts always creep up when I’m thinking on things and I’ve found more than a few instances at college where his work easily connects to various subjects. What concerned him in this particular essay was how art would fare in the era of mechanical reproduction, namely cinema and photography. Each piece of art possesses something Benjamin coined “aura”. My first caveat is this: put aside your internal definition of aura now. It is not that. He uses other, less poetic terms as well. You may find the “here and now of the work of art” to be a more useful definition. This includes any changes to a piece over time. For example, the Mona Lisa is the Mona Lisa, including any damage or changes that occurred when it was stolen and kept in a trunk for some time. That is the Mona Lisa‘s aura. What it means instead is that something is lost that was previously present. The reproduction of the Mona Lisa changes the real Mona Lisa. The original no longer contains the aura it contained as a unique entity. When Mondrian “inspired” pieces arise they reproduce what had a specific, unique aura. This especially concerns one of his most famous pieces “Composition with Large Red Plane, Yellow, Black, Gray, and Blue” from 1921—it’s reproduced again and again without consideration for its aura. One wonders how Mondrian would conceptualize transparent panels. A really cool handmade piece! But from an artistic standpoint it doesn’t mean anything. Perhaps this is why the inspiration that one could derive is only surface-level, as all else has been destroyed. At least YSL created a dress with a unique aura, a work of art—hand-crafted panels that were themselves unique pieces. Meanwhile, ten thousand identical tee-shirts meant to look like a piece evoking purity don’t seem to cut it. Go right ahead, you’d likely be correct. I’d be surprised if anyone made it down here. I wrote this mainly because I’d been thinking on it for a year or so. I do think we can think of inspiration as a loaded word, however. It flies around today, it’s a buzzword, especially in creative spheres where “copying” is everywhere. Without speaking on fair use or the idea of building off of someone else’s work, the heart of inspiration implies an understanding. What I’m not convinced inspiration is, is a surface-level copy. If there is no substance to the thing you create, could it be inspired by anything? If there is no understanding of the thing you are “inspired” by, how could you be inspired at all? I’m no fool, it’s obviously a grab for cash. Mondrian is now a brand, unfortunately. He’d probably be horrified. His name sells items that don’t even remotely resemble his work and the ones that do ignore his meaning. So much for the harmony of humanity. “Piet Mondrian’s ‘No Axiom but the Plastic’ (1923).” Modernist Architecture (blog), October 19, 2010. 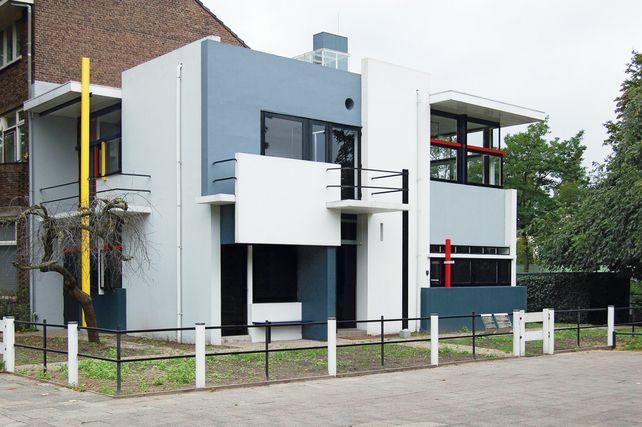 “Piet Mondrian’s ‘The Realization of Neoplasticism in the Distant Future and in Architecture Today: Architecture, Conceived as Our Total [Non-Natural] Environment’ (1922).” Modernist Architecture (blog), October 18, 2010.